At the tail end of 2010, we realized that the worst of the recession was over for us. Things were getting better. New marketing leads were coming in and we needed to better manage them if we were to take full advantage of this potential increase in business. 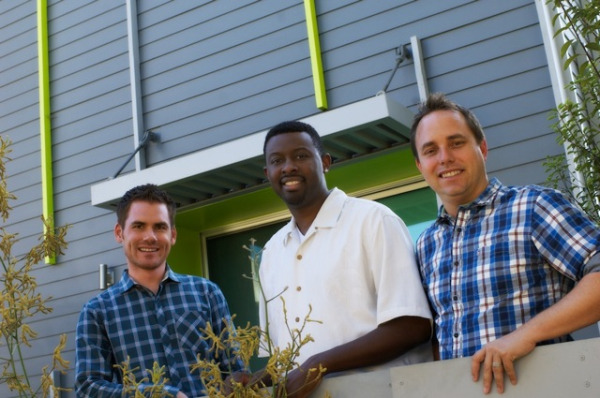 As with most small architecture firms, the three principals split up the core roles of running the company. As a principal, one of my roles is marketing manager. 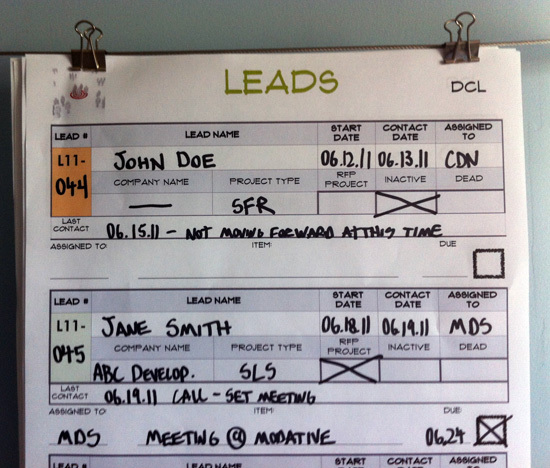 So, as 2011 approached, I worked with Christian and Michael to come up with a system for managing leads coming into the office. 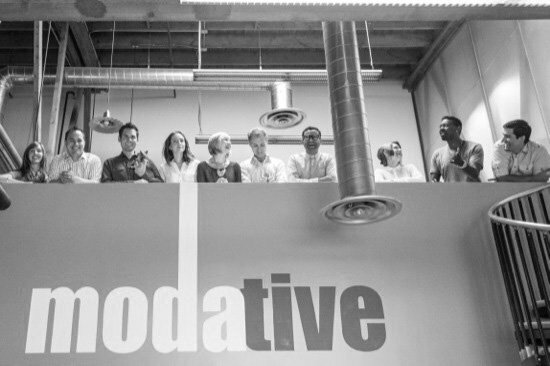 When it comes to lead generation, our office is a bit different than most architects in that about 90% of our leads come through our website. So, unlike many older offices that get high probability referral leads, we have to sort through significant noise in our web leads to find the valuable ones. This only increases our need to be more organized. 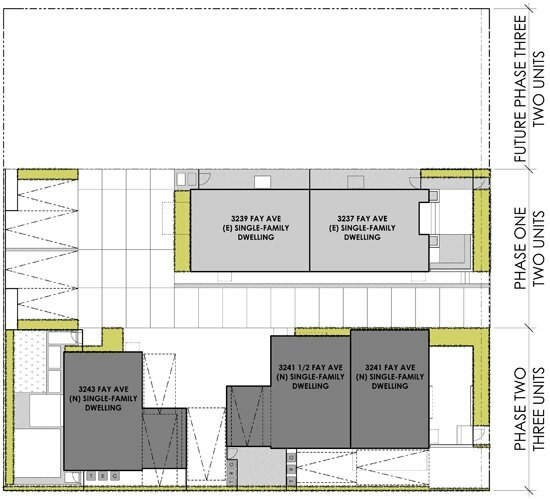 We began this process by generating two simple diagrams. 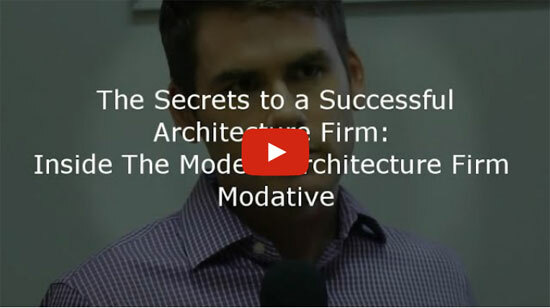 The first diagram is a simple breakdown of how Modative acquires projects. The basic idea in this diagram is that you get leads and filter them down to determine which ones become RFP (Request for Proposal) projects (a small win) and then, after proposals and contracts, which ones become real projects (a big win). 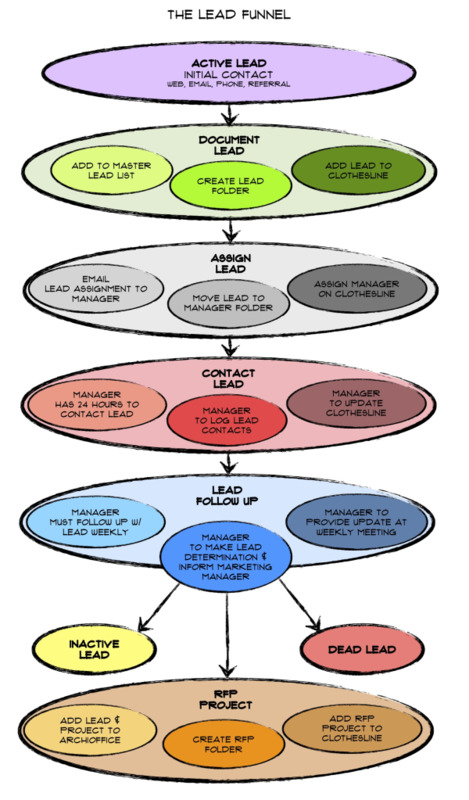 The second diagram describes our process of organizing and managing active leads. 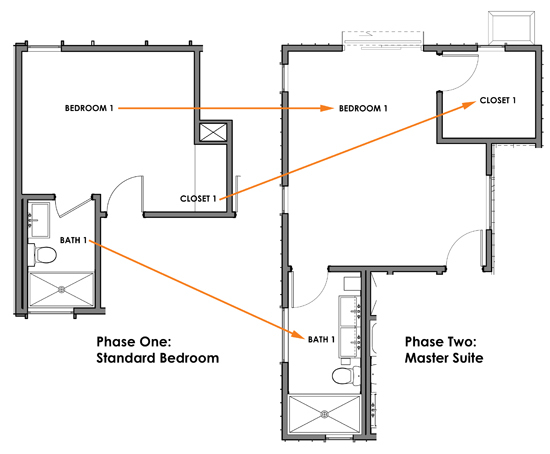 Let's take a closer look at what each step entails. 1. Add Lead to Master List - This is a simple Excel spreadsheet (we use Numbers, a Mac program) that tracks the basics and is used to give incoming leads a number. Lead numbers begin with an "L" for "Lead" and the last two digits of the year, followed by three digits - L11-001. Here's a sample of the Master Lead List. 2. Create Lead Folder - Active leads are assigned to managers and the following folder structure is copied into the lead managers folder (on the server) and given the appropriate name - "L11-044 John Doe 06.12.11". In the "Lead Log and Checklist" folder, there is a word processor file that is filled out with the same info from the Master Lead List and most often, a copy of the the web form data. Below that is a log for the lead manager to keep track of all correspondence with the lead. 3. Add Lead to Clothesline - If you missed last year's post on "The Clothesline", check it out to see one of the ways we stay organized. Similar to the Master Lead List, the lead info is added via permanent marker (old school, I know) to the Clothesline in the office for everyone to see. As marketing manger, this provides me with a quick visual on how leads are progressing. 4. Email Lead Assignment to Manger - After the lead has been documented and assigned, we send out a simple email to the lead manager, letting them know that they now have an active lead. 1. 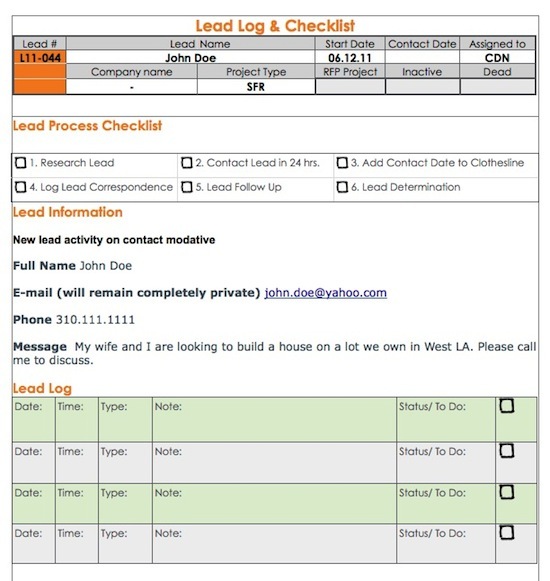 Initial Lead Contact - It is the lead manager's job to contact the lead within 24 hours and log this contact in both the Lead Log and Clothesline. Most lead managers print out the Lead Log and hand write in the information while on the phone. 2. 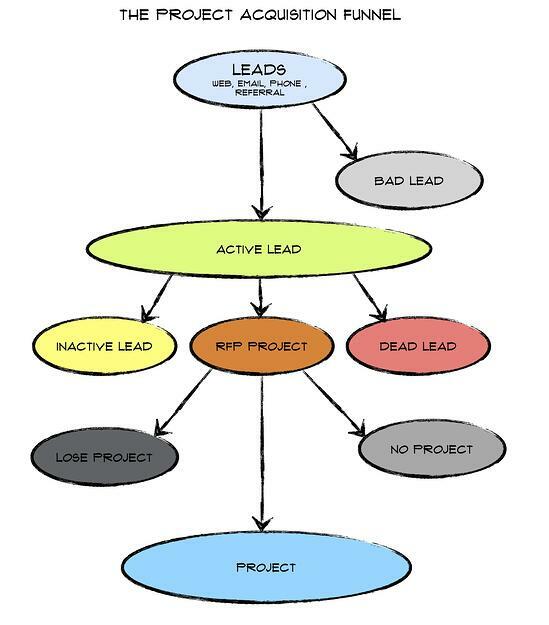 Lead Follow-up and Determination - After contacting the lead, it is the lead manager's job to determine whether the lead is "Dead", "Inactive" or has the potential to become an "RFP Project". If the lead has potential, the next step is often an in-person meeting. If that goes well, the project graduates to become an "RFP Project" when the potential client asks for a proposal. 3. Weekly Updates - At our regular Monday morning meetings, we review all active leads and managers give a quick update. Does This Lead Management Process Work? I'm sure for many, this process seems like overkill. There are several steps and many of them accomplish similar things. But for us, this system has created a series of checks and balances that has worked well versus the alternative of Post-it notes and haphazard internal conversations. 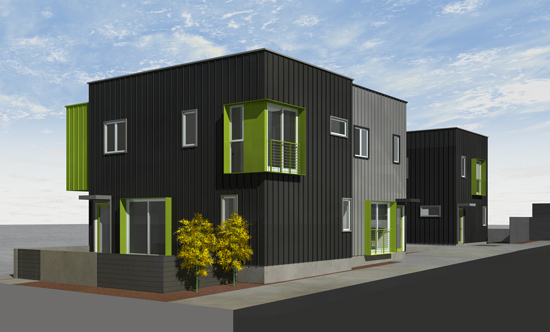 No matter how you look at it, without proper lead management, we would be lucky to get any new projects. Besides, any aspect of running our office where we can be more efficient, only leaves us more time to better serve our existing clients. What systems do you have in place at your office for lead management? Post by Derek Leavitt. Contributors to this post include Christian Návar, Krystal Návar, and Michael Scott.